“It’s a problem, it’s a universal problem,” the ex-Sunderland and Arsenal striker says. 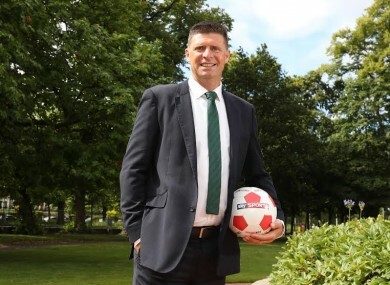 FORMER IRELAND INTERNATIONAL Niall Quinn believes the lack of top-level Irish strikers coming through is a concern, but feels the Boys in Green are not the only team with this problem. Quinn, who enjoyed a lengthy career playing for sides including Sunderland and Arsenal, in addition to scoring 21 goals in 92 appearances for his country, says Irish players are not being afforded chances in the first-team anymore. “It’s a problem, it’s a universal problem. Every manager I’ve spoken to wants to sign a centre forward, who scores goals. “For Irish lads coming through, in the (Premier League) in particular, they’re looking for people who’ve done it in South America, who’ve done it in Europe. “In my time you were given lots of time as an Irish centre forward, you were blooded in the team, there were a number of centre forwards given their chance — going back Graham Barrett, Kwame Ampadu, they all got a little look in my time, but that’s scarce now, it’s so tough to get up to the first-team pool, against talent from around the world. In my time it was Scottish, Welsh, English lads — now you’ve got to beat everyone. With Robbie Keane expected to retire imminently, the Dubliner’s departure is set to leave a big void in the Irish attack, though he has been encouraged by the recent exploits of Southampton star Shane Long. “Kevin Doyle has moved on a bit now… Shane is our great hope — and he’s 29. “All I can say to him is I played my best football between (the age of) 30-35, which is a bit sad looking back. I don’t know what I was at for 10 years. (Shane Long is) getting there, he’s getting crafty, when I saw him at Reading he had this fabulous spring, could win the ball, but wasn’t getting into the best positions, so when chances came his way, they were half chances, but now he’s working it all out. Email “Niall Quinn concerned by lack of top-quality Irish strikers coming through”. Feedback on “Niall Quinn concerned by lack of top-quality Irish strikers coming through”.